Sometimes, if the forecasted returns are not attractive to professionally managed venture funds, the founder can search for those rich individuals who are anxious to invest in start-ups, are not jaded like the "vulture capitalists," and will accept situations the professionals are unlikely to favor. The minimum investment required to join a private-venture pool is usually quite high "in seven figures" and many of the older pools are closed to outsiders. Public vehicles for venture investing are not common. Accordingly, individual-venture investors exist. The founder's task is to find them, through a combination of persistence and luck. Angel investing has become more organized and significant as many of the professionally managed venture pools are increasingly less interested in the seed round. Most angel investing is a product of chance encounters or family and social relationships, a high net-worth individual exposed to an opportunity to invest because he happened to meet the entrepreneur at a social function or was drawn to the investment through word of mouth. The typical angel round involves an investment of $250,000-500,000 to a group of one to five individuals and is sometimes called the "Rolodex Round" because the investors are names on the entrepreneur's rolodex. 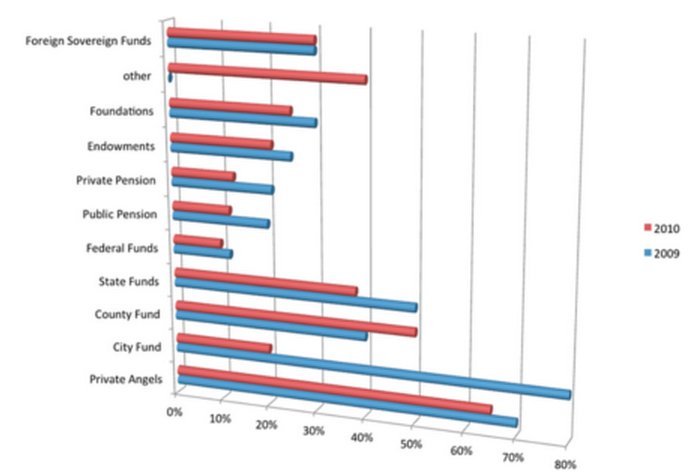 Angel investing has become somewhat more organized, as groups of high net-worth individuals with common investment goals have coalesced into, for example, the Band of Angels, a Silicon Valley organization, and the angel breakfast for participants sponsored by the Software & Information Industry Association. The organized groups of Angels usually avoid publicity so as not to be inundated with applications. How do you find them? Word of mouth (networking at the local venture-capital club) or by keeping up with the trade press, namely, the Venture Capital Journal, the Private Equity Analyst, and websites such as VentureBeat and GigaOM and Thomson Reuters PE Hub. Jeffrey Sohl, Director of the Center for Venture Research (CVR), has looked into the Angel Investor Market in 2010. Contact Sport–be helpful, get your hands dirty–this often leads to success of the company. Angel help is often done within the Angel's area of expertise. Follow your passion when funding a company.